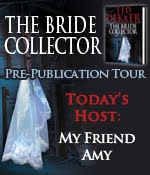 The Bride Collector by Ted Dekker Blog Tour! About the Bride Collector: FBI Special agent Brad Raines is facing his toughest case yet. A Denver serial killer has killed four beautiful young women, leaving a bridal veil at each crime scene, and he's picking up his pace. Unable to crack the case, Raines appeals for help from a most unusual source: residents of the Center for Wellness and Intelligence, a private psychiatric institution for mentally ill individuals whose are extraordinarily gifted.